Five generations of expertise are woven into these nautical doormats, which are both durable and decorative. The rope and the mats are made in Maine by local lobster fishers. Easy to care for, each mat is strong enough to withstand the ocean and elements, making it more than tough enough for water, mud, and everyday use. Dimensions: Small: 18" x 30" x 1.5"; Large: 21" x 34" x 1"
Weight: Small: 4.6 lbs. ; Large: 7 lbs. These seem really nice -- threw my old ones away. We received this as a wedding gift from friends from Maine. We love the color and how durable it is. Great door mat! 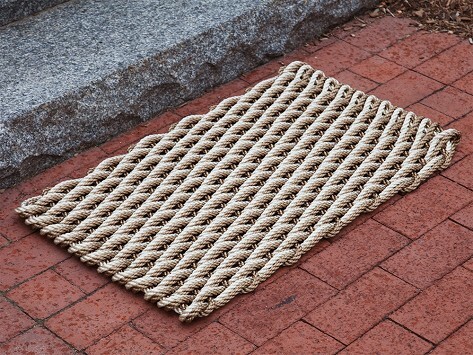 The Rope Co. creates durable nautical doormats with a true New England sense of style. Generations of rope making knowledge have gone into the materials—rugged rope strong and dependable enough to stand up to the rigors of lobster fishing. So these mats can more than handle a little mud. Much like the area of the country they come from, The Rope Co. has long and distinguished history, tracing back to founder Logan Rackliff’s great-grandfather. He founded the first family factory making lace, and through the generations, lace turned to rope durable enough for use by local lobstermen. Logan soon spun off (so to speak) from the family company to form The Rope Co., bringing his expertise to your doorstep. 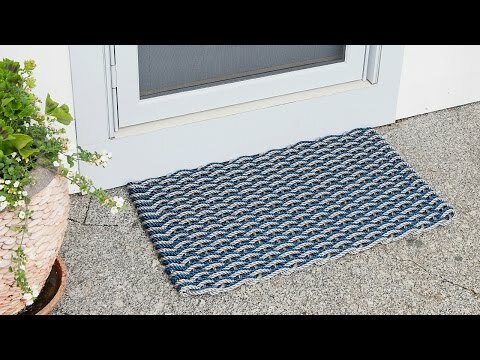 The result is nautical door mats & home accessories that are Maine through and through. Not only does The Rope Co. manufacture the materials, but many of the products are assembled by locals as well. They’re durable, easy to clean, and a boost of UV protection keeps them from fading in the summer sun. Enjoy the craftsmanship, and the rich, made in America heritage, for years to come.